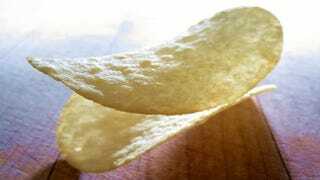 Pringles may be one of the most sci-fi foods of our time. So thin, so homogeneous, so regularly shaped that they can be stacked perfectly, these chips are truly the food of the future. But how are they made? Instead of shaving bits off of a potato and deep frying them, the company starts with a slurry of rice, wheat, corn, and potato flakes and presses them into shape. So these potato chips aren't really potato at all. The snack-dough is then rolled out like a sheet of ultra-thin cookie dough and cut into chip-cookies by a machine. The cut is complete enough that the chips are fully free of the extra dough, which is lifted away from the chips by a machine. The chips move forward on a conveyor belt until they're pressed onto molds, which give them the curve that makes them fit into one another. Those molds move through boiling oil (I would have thought rat-lard, since anything that tastes that addictive has to be terrible for you, but it's probably just vegetable oil. ), and fry for a few seconds. Then they're blown dry, sprayed with powdered flavors, and at last, flipped onto a slower-moving conveyor belt in a way that allows them to stack. From then on, it's into the cans (with usually a good inch of empty space at the top) and off towards the innocent mouths of the consumers. Here is a video of it, but fair warning: its off-brand.